Where Do Companies Source Their Materiality Data? When it comes to materiality, companies are faced with an increasing pool of documents, webinars, blog posts, articles or best practices shared in numerous sustainability or corporate responsibility websites. Most of these highlight the importance of conducting a materiality assessment process including both internal and external stakeholders, while a few others tend to debate over a common definition of materiality that should be common across different reporting frameworks, such as SASB, GRI or IIRC. However, few of them concretely nailed in the different sources a company should look at when conducting its materiality processes, just like the AA1000 Stakeholder Engagement Standard does. Do all companies conduct interviews on employees? Analyze their reputation on social media? Meet external stakeholders in person? Can we observe differences among different industry sectors? 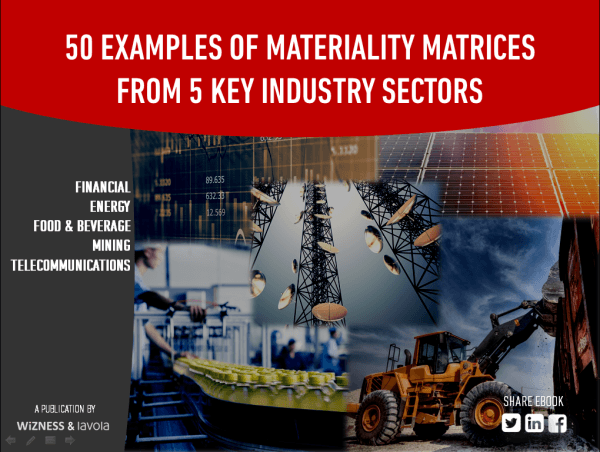 To answer these questions, we conducted a materiality benchmarking analysis on 50 companies from five different industry sectors: Financial, Energy & Energy Utilities, Food & Beverage, Mining and Telecommunications. We’ve analyzed their reports to identify the different sources they used and the internal and external processes they put in place to conduct their materiality assessments. In terms of process: Some companies started their materiality processes by identifying issues through stakeholder engagement, and then rated them internally in terms of significance. Others identified corporate risks and opportunities internally, and then engaged with stakeholders to rate them. In both cases, the materiality matrix resulting from this process is useful to discover and visualize similarities and disparities between internal business perspectives and external stakeholder concerns. In terms of sources: Some of the sources listed above seemed more efficient than others as they appeared more frequently in our panel. “Internal dialogue” was a common materiality source in all sectors, along with “stakeholder surveys” and “interviews” with sustainability or industry experts. Some companies were very creative when it came to “internal dialogue," as numerous ideas were implemented: employee workshops, one-to-one interviews with top or middle management, online portals, and even an Employee Engagement Day. In conclusion, a combination of qualitative and quantitative research methods and sources will give a balanced view of which issues matter and their relative significance both for the business and stakeholders. Materiality assessment is a requirement for GRI G4, but also is a strategic, management, engagement, reporting and discovery tool -- which should be adapted to both the reality of your company and your stakeholders. Marion Dupont is the Marketing Manager of Wizness Publisher and helps companies create and publish interactive CSR reports online. She tweets @Wiznessplatform.